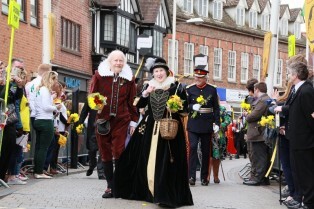 For Shakespeare’s Celebrations, the local initiative tasked with organising the annual Birthday Parade, plans are coming together to make 23rd April 2016 memorable, celebrating 400 years of Shakespeare’s legacy with a unique ‘take’ on the traditional annual procession through the town. The festivities will combine birthday and commemoration in a day full of music, colour and action. “Preparations are well under way for the Parade in this significant year for Shakespeare’s legacy, and for his home town of Stratford-upon-Avon. In a departure from convention, spectators will see parade participants gather at many places around town this year; the ‘mini-parades’ will be escorted through the streets to their flag stations in Henley Street, High Street and Bridge Street. Following the Flag Unfurling Ceremony, the whole procession will continue as one in festival mood along High Street, Chapel Street, Church Street and Old Town to Shakespeare’s resting place. Sarah continued: “We want the crowds lining the route to join in the ceremonial, throwing sprigs of fresh rosemary underfoot as the procession passes by in sombre mood in a walk of remembrance. And later as the party starts we are looking for a photographic moment to savour with our specially commissioned Shakespeare masks. We need everyone to join in! All the usual participants will be there too, among them civic dignitaries, VIPs and invited guests from the worlds of literature and theatre, students of Shakespeare’s school and characters in period dress, marching bands and local schoolchildren making their way through the streets towards Holy Trinity Church. BEFORE THE PARADE: from 9.30 am: Students from local schools will be handing out sprigs of fresh rosemary and commemorative Shakespeare face masks to visitors lining the route of the Birthday Parade. MUSTER OF GUESTS AND PARTICIPANTS from 10.15 – 11.00. Primary school children, staff and students of King Edward’s School led by the Head Boy, invited diplomats, civic dignitaries and guests of the Town and District Councils follow the route of the floral tribute to take up their positions for the main ceremonies in Bridge Street. At the same time, several ‘mini-parades’ assemble in designated town centre streets and following the flag ceremony they join the main procession on its way to Holy Trinity Church. BIRTHDAY COMMEMORATION, MASK MOMENT AND A SURPRISE ENTRANCE 11.00 – 11.10 The traditional placing of the commemorative wreath is followed by the unfurling of the Big Birthday Banner and the Unfurling of Flags along Bridge Street. There is an invitation for everyone to take part in a ‘Mask Moment’ and put on their masks of William Shakespeare as the Beadle and Town Criers from neighbouring towns call for ‘Three Cheers for William Shakespeare’. Then our invited New Orleans Jazz Band bursts into action with its rendition of ‘Happy Birthday!’ as cannon streamers shower the crowds and the band plays its way around Bridge Street. PARADE TO HOLY TRINITY CHURCH 11.10 – 11.50 Accompanied by the ATC Band, Coventry Corps of Drums and the New Orleans Jazz Band, the procession makes its way to Holy Trinity Church where the town’s floral tribute to William Shakespeare is formally received. Once the Procession is over there are community festivities and street entertainment taking place across town throughout the day, organised by the Shakespeare Birthplace Trust, the Royal Shakespeare Company, and others. The annual Birthday Luncheon starts directly after the Parade and is a ticketed event. If you are planning on driving to the Celebrations, vehicle access to the town centre is restricted between 8am and 12.30pm to accommodate the Parade and Celebrations. Details of road closures will be available in due course from Stratford-on-Avon District Council. More details about Shakespeare’s Celebrations 2016, and especially the Birthday Parade, will be available from www.shakespearescelebrations.com in the coming months. The main Parade will take a route from the Town Hall along Sheep Street, Waterside, Bridge Street, High Street, Chapel Street, Church Street and Old Town to the Church. Spectators will be able to watch guests and participants join the procession at various times and points around the centre of town, such as Wood Street, Meer Street and Henley Street, and make their way after the Flag Unfurling Ceremony to join the main procession. The Quill and Flag Unfurling Ceremonies take place as usual in Bridge Street, with the dais positioned near the roundabout outside Barclays Bank. Flagpoles will be draped in black crepe and the main streets festooned in black and gold bunting, to combine the birthday and memorial themes. The Walk of Remembrance, as participants follow the town’s floral tribute from the Town Hall as far as Bridge Street, to the toll of a funeral bell, spectators will be encouraged to throw rosemary in their path. the traditional, annual birthday ceremonies of the Handing Over of the Quill and the Flag Unfurling. a unique ‘Mask Moment’ for this year’s commemoration of 400 years since Shakespeare’s death when spectators will be invited to don a Shakespeare Face Mask, commissioned especially for the 2016 Celebrations. marking the Bard’s worldwide legacy in this significant year, we are delighted to have international participation in our Parade in the shape of the Jazz Band from the School of Liberal Arts at Tulane University, New Orleans, USA. They will burst into action as the Birthday procession moves off in festival mood through the streets to the Church.